Nick Bradbury: Feed Overload? Hit the Panic Button! If you've been reading feeds for a while, chances are you've experienced feed overload. It happens to the best of us. Perhaps we take a break for a day or two, and when we come back to our aggregator we find hundreds of unread items waiting for us. Even though we don't have to read them all, we're so used to email that it's still stressful seeing so many unread items. That's when it's time to hit the panic button. You can, of course, turn off the automatic detection and simply display the "panic button" whenever you like - but in my case, I like having it pop up and offer to mark stuff as read. And I don't have to be concerned about missing some important thread just because I let the panic button mark items read, since I can still use FeedDemon's "popular topics" to uncover the things people are talking about. I really hope the panic button itself isn't the final artwork, but it's a brilliant idea. @critter: there isn't a shortcut by default (at least, not yet), but you can assign one. what do you think to "The best panic button in the world.com"
Nick - thanks for this feature. It's exactly what I was after. Nice feature Nick however like the Clean Up Wizard, I find that its usefulness is neutered because you cannot apply the action to a single folder - it's all or nothing. I have some folders which I want to clean up but others I don't, currently neither the panic button nor the Clean up wizard will help with this. What's the panic button? Is it "OK"? Wouldn't it be nicer to make a UI that didn't map a notional "panic button" to a different physical button with the label "OK"? If you want to give people a "Panic Button", you should make it an actual button. I'll be you get no small percentage of users clicking on the graphic that looks like a button, thinking it's an actual button. ...and also, isn't your basic point "hey, this isn't email, you don't need to stress about reading everything" actually at odds with the giant red PANIC button? Shouldn't it really be "Don't Panic, these things aren't important"? Your message to users should consistently be: FeedDemon has it covered, don't worry. You should consider making this a "Don't Panic" button, or maybe "Don't Worry" button. @Thomas: I've had several people mention that the "OK" button is confusing, so I've changed this in the next build, and I've updated the above screenshot to reflect the change. Well, I still think that you shouldn't be encouraging people to "PANIC" when they get to this point, you want to be suggesting a calm solution. After all, when there's a fire, and you hit the Panic button (the fire alarm), it's no guarantee of immediate relief, more like an *escalation* of panic. Panic buttons are for raising the alarm, not suppressing it. This interaction is more like a "relief" button, or a chill out button. 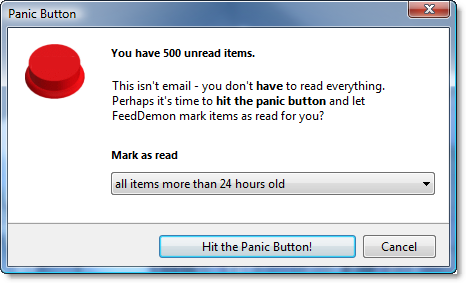 I love the idea of the Panic Button, I often read down feeds and the mark everything as read when I see that the current item is older than 24 hours. One thing I would like though is a way of marking specific feeds so they aren't affected. For example I love Scott Adam's Dilbert Blog, the posts don't go out of date and aren't superceded so I'd never want to just mark them without reading. On the other hand many of Scott's posts require some thought so I only look at them when I've got a reasonable amount of time to spend, whereas I'll flick through a few Gizmodo posts whenever a minute or two presents itself. Could you add an option to protect the 'Golden' feeds?